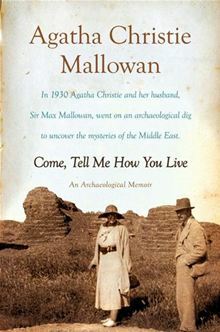 In 1930, Agatha Christie married her second husband, Max Mallowan, an archeologist, and spent many happy seasons accompanying him on his archeological digs in the Middle East. Her experiences with the people and the environment then became inspirations for many of her most famous novels including Death on the Nile, Murder in Mesopotamia, and Murder on the Orient Express. Agatha Christie wrote Come, Tell Me How You Live as response to the many people who asked her what it was like to travel around the cradle of civilization on her husband’s expeditions in Syria, Iraq and many other places. I ADORE this book. From lamenting over her husband shoving books into her carefully packed crate at the last minute to becoming tongue-tied with feeling inferior while chatting with their architect to running out of her bedroom screaming due to being covered in mice and cockroaches (her husband recommended that she just go to sleep and then she wouldn’t notice them crawling over her…yeah right), I just found Agatha to be so lovely and Britishy and wonderful! She manages to be both neurotic yet brave, awkward yet charming, silly yet shrewd, much like a heroine in a Sophie Kinsella or Katie Fforde novel. Come, Tell Me How You Live is the perfect mixture of personal memoir and travel adventure and a fascinating snapshot of the relationship between European archeologists and the Middle Eastern peoples during the years between the wars. This little known book is a fun read for all armchair travelers and Agatha Christie fans.